As has been reported through various media outlets – KSWO, Lawton Constitution, KJRH, KFOR – vandalism is on the rise at the Wichita Mountains Wildlife Refuge. In July, large areas of graffiti were removed in the Parallel Forest and on Mt. Scott thanks to a number of volunteers including the OKC Chapter of the Alpine Club. The Alpine Club members were able to use their climbing skills and equipment to remove graffiti in some otherwise inaccessible areas. Most recently in November, FOW volunteers worked on cleaning up the graffiti in the Narrows area. 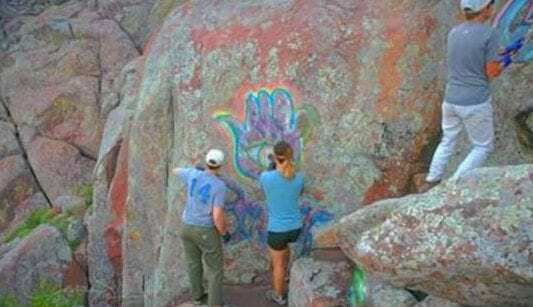 Please report graffiti or vandalism of any kind on the Wichita Mountains Wildlife Refuge to the authorities and to us so that we can schedule volunteers for clean up. Crime Stoppers detective Charles Whittington gave a presentation to the FOW board about the process of reporting acts of vandalism or any crime witnessed in the Wichita Mountains Wildlife Refuge. Hopefully, Crime Stoppers (580) 355-4636 along with the USFWS ‘Tips Hotline’ (844) 697-8477 will thwart some of the vandalism we have been seeing on the refuge. You can support the efforts of the Friends of the Wichitas by volunteering, donating or becoming a member.